We stock a vast range of Bioplast labrets and other products from the Bioplast Body Jewellery range. 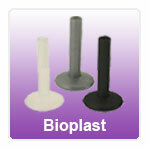 Bioplast can be fully autoclaved so is safe for use in an initial body piercing. Bioplast monroe studs are ideal for most facial piercings. We only sell genuine Bioplast purchased directly from the factory - beware of cheaper acrylic alternatives..